From Thursday 13 September 2018 until Sunday 22 December 2019: Enjoy 40 % off! From Thursday 13 September 2018 until Sunday 30 June 2019: Enjoy 40 % off! Sudamala Resort, Seraya offers a glimpse of paradise on earth in its island resort situated on an idyllic Seraya Kecil island. The property offers secluded getaway in a breathtaking setting of a secluded island with the abundance of pristine natural wonders, ringed with translucent white sandy beaches, crystal-clear waters, and vibrant underwater life for an ultimate Robinson Crusoe experience.Have fun in the sun at Sudamala Resort, Seraya with summer activities like snorkeling, scuba diving, and kayaking. 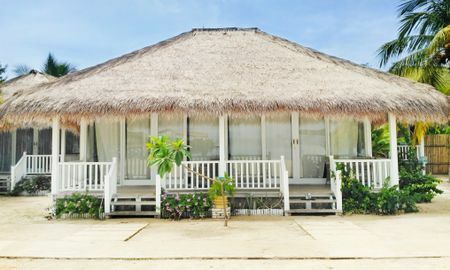 With whitewashed cottages canopied by the natural alang-alang thatched roofs and the colourful sprinkle of bougainvillea spreading the tropical vibe at its front yard, the elegant beach bungalows at Sudamala Resort Seraya offer an understated luxury in the sublime setting of Little Seraya Island. 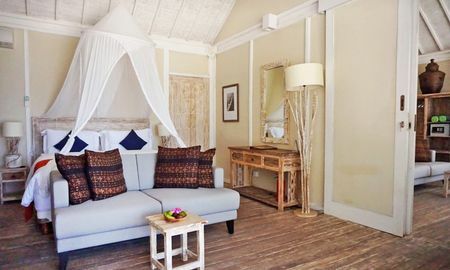 Each bungalow occupies a cloistered space that offers a total privacy for honeymooners. 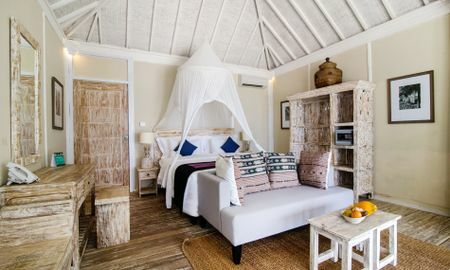 Each room is equipped with amenities befitting discerning adventurers, including, water heater, four-poster beds and a wooden-deck verandah that overlooks directly to the sapphire ocean. Seraya Restaurant and Bar directly overlooks the island’s beach to offer the ultimate sunrise experience. From here, with the stunning sparkling pool and turquoise waters stretching out in front of you, watching the sun’s morning glow slowly rising above the horizon line inspires you to take the time to ponder the astonishing workings of the universe. Later on the day, laze away with a cocktail on hand at the resort’s private beach or the beachfront saltwater pool. Soak your feet onto the soft powder of white sands and bask into the torrent of endless tropical sunshine. Slip on to one of the sun loungers and let nature do the rest. Situated in a secluded island with only 24 bungalows available, the Resort provides the perfect location for an intimate wedding in a paradise island. Float down your sand-swept “aisle” to a beachfront ceremony and imagine saying your vow under the canopy of the blue sky while being serenaded by the gentle lulling of the flowing waves. Komodo Labuan Bajo Airport is only 7 km away from the property. The Resort is only 0,2 km away from Seraya Kecil House Reef. Please note that the property uses a satellite connection, therefore the WiFi internet speed may be very slow. Please inform Sudamala Resort, Seraya in advance of your expected arrival time. You can use the Special Requests box when booking, or contact the property directly with the contact details provided in your confirmation.